Amélie Barras, an assistant professor in the Department of Social Science in the Faculty of Liberal Arts and Professional Studies, has co-authored a new book that focuses on the lives of Muslim Canadians. Alongside colleagues Jennifer Selby (Memorial University) and Lori Beaman (University Ottawa), Barras demonstrates how Canadian Muslims successfully incorporate their religion into their daily lives. The book, Beyond Accommodation: Everyday Narratives of Muslim Canadians (UBC Press), takes a fascinating look at the lives of Muslim Canadians. By undertaking interviews in Montreal and St. John’s, the authors were able to gain real and meaningful insights into their experiences. “The book also seeks to reflect on the politics and power relations laden in the everyday lives of our participants and how those shape their negotiation strategies,” adds Selby. 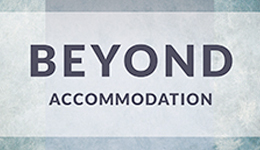 Beyond Accommodation goes beyond the traditional scholarly literature on Muslims in Western nations that tends to focus on problems of integration, failed active political participation or requests for accommodation. The book shows a different perspective by demonstrating how Muslim Canadians often successfully navigate and negotiate their religiosity in the mundane moments of daily life. The authors sought to critique the Canadian model of reasonable accommodation, suggesting that it disempowers religious minorities by implicitly privileging Christianity and placing the onus on minorities to make formal requests for accommodation. They also address the politics laden in knowledge production on Muslims in contemporary Canada (including their own positionality) and reflect on their participants’ experiences with Canadian “secularism” that acts as a serious obstacle to equality. “We hope the book offers an alternative picture of how religious difference is woven into the fabric of Canadian society, particularly through our proposed notion of ‘mutual respect,’ ” says Barras.